Antimicrobial resistance develops when antibiotics are overused, or misused, and encourage mutations in pathogens that will allow them to become resistant to current medicines. Bacteria are becoming resistant to antibiotics at an alarming rate. Excessive or misinformed prescribing practices can contribute to this issue, rendering some bacterial infections untreatable. Antimicrobial resistance disproportionately affects the world’s poorest populations, where access to medicines is limited and disease transmission rates are high. Through discussion around the AMR pandemic, we can encourage further research into novel antibiotic alternatives, proper prescribing practices, and ways to limit the growth of resistance development. 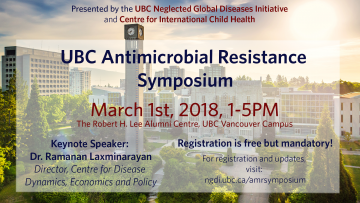 Join the UBC Neglected Global Diseases Initiative, in association with the Centre for International Child Health, for the Antimicrobial Resistance Symposium on March 1st, 2018, and show your support for AMR research and innovation. Hear from internationally acclaimed experts in antimicrobial resistance and health, and explore the various avenues that perpetuate resistance to antibiotics, while learning about possible solutions to this worldwide crisis. Panel Members: Dr. Ramanan Laxminarayan, Dr. David Patrick, Dr. Ashley Roberts, Medical Director, Antimicrobial Stewardship Program, BC Children’s Hospital, and Dr. Robert Hancock, Director, Centre for Microbial Disease and Immunity Research, UBC. Welcome: Dr. Victor Leung, Symposium Chair: Medical Director, Infection Prevention and Control, Providence Health Care. Dr. Ramanan Laxminarayan: Director, Center for Disease Dynamics, Economics & Policy; Senior Research Scholar, Princeton University; Former Advisory Committee Member, World Health Organization, Centres for Disease Control and Prevention. Topic: Canadian Networking and Response to AMR – What can we offer the rest of the world? AMR disproportionately affects the world’s poorest populations, with a greater burden of infectious diseases, a lack of infrastructure, infection control and antimicrobial stewardship. This panel will explore how local health, prevention and innovation can have a global effect, helping turn the tide of antimicrobial resistance. Thank you to all that attended! Please email simona.powell@ubc.ca for any inquiries regarding the event.